In 1987, Marvel UK launched their weekly ThunderCats comic, designed to tie in with the cartoon show, which had recently made its debut on BBC1 to huge audience figures and great acclaim. The comic began by reprinting stories that had first appeared “across the pond” in the US ThunderCats comic – however, with the US comic having been monthly and the UK version weekly, it quickly became necessary for Marvel UK to begin producing their own stories. Continuing the great standard set by their US counterparts, Marvel UK made certain that they had some of the best writers and artists in the country working on their comics. They had already been setting standards of excellence for boys’ comics with their long-running and successful Transformers comic, and ThunderCats was a continuation of this. 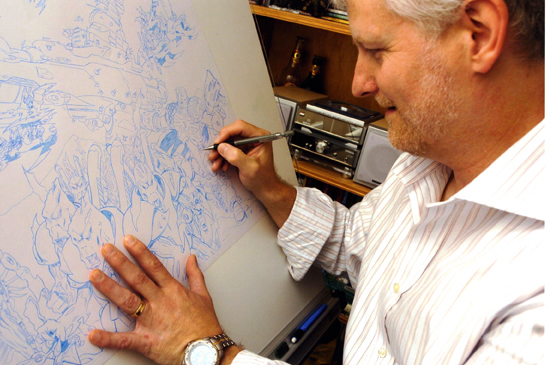 One of the creative team involved in ThunderCats was artist Tim Perkins, who already possessed a highly impressive CV prior to his work on the comic. I had the opportunity to speak with Tim back in May (2006), and below are the answers that he gave to me. I would encourage anybody who wants to learn more about Tim, his influences, his CV and his artwork to check out his superb website, which is www.wizards-keep.com . First of all, Tim, many thanks for taking the time to answer my questions! Let’s start with a bit about your early life and early career - when did you start drawing and how did you get into illustrating comics? Do you remember the first work you had published? I have vague memories of drawing when I was a young child, even before going to school. My parents have always said that from as soon as I could hold a crayon I have drawn. I was about eight years old, when I decided I wanted to be a comic artist. My Dad had bought me some American comics and this was my first exposure to the work of Jack Kirby. These two guys, my Dad and Jack Kirby (through his wonderful art and stories) are the reason I wanted to be in comics. After school I went into the sixth form and studied amongst other things Art and English “A” levels. Following this I studied Graphic Design at Blackpool College of Art and Design here in the UK. When I left there I spent time as a Graphic Designer both freelance and in-house for various companies, before seeing an ad in the Mighty World Of Marvel comic in the early mid-eighties asking for aspiring artists and writers to submit their work to Marvel UK for the chance to have it published in the Showcase section of the comics. This I did and low and behold they thought it worthy of inclusion and my story “Metempsychosis” saw print in issue #14 of MWOM. There was no fee involved, but at that stage, who cared? I was in print in comics at last and Marvel comics at that. This was followed by work for Harrier comics on their anthology comic “Swiftsure” where I worked on “Kin” and “Ram Assassin”. This was low pay but it was continuing to showcase my work. Most of the guys that started at Marvel UK around the same time worked for Harrier for a while. Martin Lock the guy that owned Harrier helped us all get a foot on the ladder in this respect. Guys like; Mike Collins, Mark Farmer, James Hill, Art Wetherall, Kev Hopgood, Stephen Baskerville, Steve Yeowell, oh the list goes on – it was a veritable who’s who of UK comics at the time. I received a complimentary copy of MWOM #14 with my work in it and a compliment slip from the guys down at the Marvel UK offices asking if I would like to show my portfolio of work. It was there at the Marvel UK offices I met Barry Kitson. He was pencilling the British version of the Spiderman comic at the time. He asked me if I would like to try inking his pencil work. I inked some of his sample work and sent it in to Marvel, who gave me a great response, but no work. I collaborated with Barry a couple of times more and got the same response, "Great stuff Tim", but still received no work. My break came in mainstream comics when I was asked by Barry Kitson to help ink an issue of Transformers that he was a little late with. That was Issue #50 of the Transformers comic entitled “Dinobot Hunt Part 4”. How did you come to work on the UK ThunderCats comic? Were you working for Marvel UK at the time, and if so what had you been working on (both with Marvel or otherwise) prior to working on ThunderCats? Well as I have said I was working on Transformers after the showcase story and the Harrier work. This was followed firstly by Zoids then Dr. Who and then if memory serves me correct, it was Thundercats next. I remember well being in the side room of the maternity ward in the same hospital where I was born and my daughter Joanne had been born some four years earlier. My wife Margaret was expecting our son Simon and I had a cover for Thundercats that needed inking. The deadline was looming so I inked it there in the hospital. Without digging the comics out I’m not too sure which cover it was, but I think it was an Art Wetherall pencilled job. How familiar were you with the ThunderCat characters, and with the property itself, prior to working on the comic? Did you have to do much research? Did Marvel provide you with reference or resource materials to show you what the characters were supposed to look like, or did you have to research them yourself? I was lucky that I already had my young daughter so I was aware of the cartoon on the TV. I was the inker and sometimes colourist for the comic so most of the work was already there, depending on who the penciller was and how much detail they provided. We already had videos and toys at home so that helped - laughter. I always like to approach things this way with the licensed stuff. Marvel did however provide some character turnarounds and the like. These are the artwork style guides that the cartoon companies provide their artists with and they also send them out to licensing companies so guys like us know what the characters look like in a 360° circle. As the inker you had the ultimate responsibility to keep the characters on model as yours was the finished line work that would see print. The editors would make notes on any characters that maybe needed a little touching up to keep them on model. The deadlines where such that we used the same approach as the Americans use on their comics using a team of guys to meet the weekly deadlines. This is why there was always a rotation of artists, because of the gruelling deadlines that needed to be met every week. Do you recall what material of yours made it to print in the UK ThunderCats? I worked on so much stuff its hard to remember everything. I always remember someone saying to me when I first got into the comic business that I would get to a point in my career when I would forget some of the stuff I had worked on, until someone else reminded me of it, usually fans and I didn’t believe it at first. But it is very true you work on so much stuff and half of the time it comes with tight deadlines and you do just simply forget as time moves on. That said I know I worked with some great guys; I inked a cover of Mumm-Ra pencilled by Steve Yeowell. I probably worked most of all with Martin Griffiths on covers and the comic pages too, on the Thundercats stuff. I also had the privilege of working alongside the late and great Art Wetherall. There are some unused pencil and pencil and ink pages somewhere in my archives, which I did for Marvel UK, which I haven’t seen in years too. I also produced some colour covers, one of which is a Steve Yeowell job that he pencilled and inked, I still own the originals to the colour covers. When I am next in my archives I’ll check the pages and send you copies of them, via email, to display on your website, which is excellent by the way, if you would like me to. When working on ThunderCats (and working for Marvel UK in general), how much freedom of creativity were you allowed? When you received a script, how specific were your instructions on what you were asked to draw? I think that all of us guys were given quite a lot of freedom in the days when we worked on the early licensed stuff. As time has moved on, more and more restrictions have been put in place. In the early and mid eighties we were working in new territory with these kinds of characters. Up to this point the UK comics had been mainly black and white and certainly most were not glossy. The editors were not being asked to restrain the artists as much as they do nowadays. The writers had more freedom to create stories more like those in the TV shows and then some. As long as the characters were like those on the TV or in the toy range things were okay. So as long as Lion O had his correct costume and sword, looked basically like he did on TV and his costume was coloured correctly we were safe. The artists pretty much did what the writers were asking for in the stories. The difference between the way the American and the UK writers used to work was The guys in the USA used the plot system, whereby the script is a brief (more so depending on the writer) description of the basic story and the artists then decide the pace and mood of the story, which when complete goes back to the writer to be written. In this case the artist usually puts a few notes on the art boards to describe what is maybe being said, etc. In the case of the UK writers, they wrote full script, with panel descriptions and sometimes even layout information. As far as the layout was concerned the artist could choose to either go with what the writer had written or use a layout better suited to the artist’s vision. I remember working on the Power Rangers Zeo comic for Newsstand Publications in the nineties and being told that under no circumstances could the characters be shown to be fighting or hitting each other…The entire premise of the TV show was these kids with fighting skills and power enhancements had to bash the ecch out of the bad guys. The writer was asked to sort out the baddy in a new and ingenious way every month by having the bad guy somehow blow up!!! So I see things have changed with the licenses. The licensors seem to be so worried that the parent companies that own the rights to these TV, or cartoon shows, or toy ranges may be offended by something that they use the ultimate in pre-emptive damage control. In the industry we call this dumbing down. Although I see this more with the UK versions and maybe not so much with their American counterparts. Continuing on that same theme, did you ever submit artwork to the “powers that be” at Marvel UK that they asked you to re-do for any reason? Fortunately, no I was lucky here. I was never asked to re-ink or colour anything. I never thought of this before. A lot of other companies have asked for amendments, usually because of changes they have decided to add after they have received the finished artwork, which had nothing to do with bad artwork, but everything to do with a change of heart from the editor regarding some story element in a story or something. Luckily with Marvel that was never the case. Although there were a few occasions were I was asked to redraw some stuff pencilled by other guys, when I was inking. Was there a specific ThunderCats character that you particularly enjoyed drawing? I’m sure a lot of male artists would probably say Cheetara! I suppose I enjoyed the opportunity to work on Mumm-Ra and S-S-Slithe. I always think the bad guys are the best to work on as you can do so much more with them. Lots of mood and atmosphere can be added to their scenes. That said they were all fun characters to work. And yes Cheetara was fun too, she was my daughter’s favourite after Lion O. Do you have any special memories of working on ThunderCats, or any memories that particularly stand out? It was a time where I really didn’t have time to think much about the work. I enjoyed working on the comics, but it was a manic time with mad deadlines and candle burning at both ends. But it was also a time when I began to realise my dreams and felt I was very lucky to have broken into the industry and was working with a great group of very talented people. I was working for Marvel comics the best known company in the world to produce them. It was great!!! My most vivid memory of Thundercats is working in the Hospital as I have said. That and watching the series on TV with my young daughter. Oh yes and buying the toys too – for reference of course – laughter. Since working on the ThunderCats comic, can you give us an overview of what you’ve worked on since then? Are you still involved in illustration today, and does that still include work on comics? Dreamstone, Dark Dominion, Chameleon Cat, Big Book of Death, Twins of Elvedom, Judge Dredd, Rogue Trooper, Earthworm Jim, Phage Shadowdeath, Dark Crusade, and lots and lots of other stuff. Too much to mention here, but it is on my website. I worked out in Manhattan in New York for nine months in 1993 and 1994 for Jim Shooter at Defiant comics just returning home over the Christmas holidays before returning out there. This was an incredible experience for me, although I did miss my then young family. I was privileged to work alongside guys like Steve Ditko, although I never met him, unfortunately, Alan Weiss, Len Wein, Dave Cockrum, Joe James, Janet Jackson, Charles Yoakum and of course the legendary Jim Shooter, amongst a whole host of other very talented guys. In 1999 I decided for numerous reasons, one of which was the implosion that we were still seeing the aftershocks from in 1994 to the comic industry, to leave comics. I was probably busier at the end, however, then I ever was, producing 38 pages of pencils and inks, layouts for other artists to work to on another three or four books, colour guides for computer artists on a couple of others for Newsstand Publications and still working for a number of other companies every month. I knew other guys that were leaving the industry in droves and was only waiting for the bubble to burst at the end. The deadlines were beginning to affect me too though and I felt like I needed a new direction. That new direction came when I entered the Theme Park industry as a conceptual artist. I had felt a little constrained in comics for a while toward the end and felt I wasn’t being allowed to be truly creative. The first couple of weeks in this new industry proved to be nail biting ones for me. I had been used to being given a tight script with little or no room for creativity, and here I was suddenly being asked to draw all manner of things with the brief being along the lines of; “ We need a cowboy setting or a space setting or any other manner of creative scenery”. Once I settled inside the first two week period into realising they wanted me to use my imagination again, something that for a number of years had been progressively stifled in comics, I began to relax and enjoy myself again. I have worked on projects here in the UK like Blackpool’s Valhall ride. I have produced themed concepts all over the world too in places like Dubai (where I worked for a while) Doha, Bahrain and Kazakhstan, to name but a few. This lead to another switch in direction a year later (although I have continued to produce work for the theme park industry to date) when I entered the world of animation, where I have produced lots of different work in different capacities. I have produced conceptual designs, character designs, layouts, colour key artwork, backgrounds, pre and post production artwork, storyboards, and even script writing. I never expected to return to drawing comics again for a mainstream publisher, but one should never say never, I have come to learn. I had begun work a couple of years ago on a new project called “Worlds End” (I had conceived the idea in the eighties) around the time that Toontastic editor-in-chief, James Hill asked me to work on the Lucky Bag comic, which I did for a while and it was then that I realised how much I missed them. Whilst working again for James I worked on Thor Losers and Sgt. Minor, both written by UK writer Pat Kelleher, whom I had worked enjoyably with several times in the past. I have recently worked on album covers for music CD’s and lots of Graphics and Web Graphics work too. Do you have any current or upcoming projects that you’d like to tell us about? Last year I set up a new company called Wizards Keep Limited. This is a publishing house as well as an on-line shop that sells products produced by me. At the moment I have signed and numbered limited edition Sketch Books, signed and numbered limited edition Giclee prints of some of my illustration work, posters, and original artwork for sale. There are also private and commercial commissions pages where you can commission me to produce artwork. Coming soon is a range of ceramics and new prints and Sketch Books. I am in talks at the moment with a number of sculptors and manufacturers in regard to producing signed and numbered limited edition resin figurines and also later a toy range based on concepts and characters created by me. The main thing I am working on artistically at the moment is a fully painted Graphic Novel series called “Worlds End”. I have written the first story arc for the characters and I am around a quarter way though pencilling it. It has had to go on the back burner for a while to enable me to set up my new company. I am now back behind the board, however, and enjoying every minute of it. This is a very exciting period for me and I have already tentatively spoken to a small number of other creators about another project I have in mind for Wizards Keep and also in regards to perhaps publishing their work sometime in the future. A final couple of questions – did you get chance to see any of the ThunderCats comics published by DC/WildStorm in the US a few years ago, and if so, what did you think of them? And, if there were any more ThunderCats comic projects in the future, would you be interested in working on them? Firstly, yes I did see the Thundercats work produced by DC/Wildstorm a few years ago and they were great. Around that time lots of the same characters I had cut my teeth on in the comic industry were suddenly in vogue again. Titles like Transformers and the like. It felt great and stirred up a lot of happy memories for me. The production values were the big difference. Things in the industry have moved on enormously as far as technology is concerned, since I started working in comics in the early-mid eighties. Computers have enabled artists to create some really wonderful stuff. Real eye candy as they say nowadays. Secondly as for would I work on any future Thundercats comic projects; I certainly would. They were great characters to work on and if anyone out there would like to see me working on them again, please check out the commercial commissions page on my website www.wizards-keep.com and we’ll talk. Well this was fun, Chris, thanks for asking me to take part in this interview, I really enjoyed it. to show our appreciation towards Mr. Perkins. To view the original pages (along with many more pages of art that Tim generously allowed us to display), please visit our ThunderCats Original Comic Art Gallery! © 2005-2007 Thundercatslair.org. All Rights Reserved.